Introducing a new feature on The Beauty of Life: Is It Wearable?. It's about those colors you'd love to try but are afraid to wear out of the house. From turquoise eyeshadow to gold blush, we try it all. But the real catch? We're wearing these crazy colors DURING THE DAY. A gel blush is great for the summer heat! It gives a hint of color and doesn’t streak when you sweat. 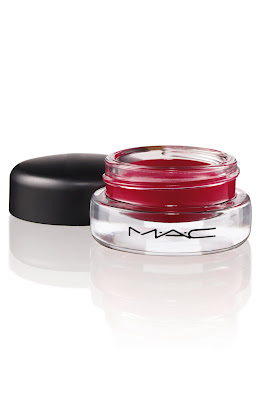 But when I got the M.A.C Just A Pinch Gel Blush, my first thought was, “Pinched how hard?” The pot was vampire blood red! Could I wear this blush without looking like Bobo the Clown? Turns out the formula is super sheer. It is, however, a real red, with no undertones of pink or bronze. After I applied, my cheeks turned a shocking red. After a minute, the gel kind of sank into my skin, creating a flushed glow. The shade was the EXACT color of my face after getting out of a hot shower. In fact, I thought the blush lasted post-wash, only to find out it was a color replica. The trick is to use a light hand (or in this case, a light finger), and layer for intensity. I decided to take the ultimate Is It Wearable Test by taking this rouge pot with me on a weekend trip to The Parents’ House (and yes, that would be the sig other). This was a darling to bring traveling. Unlike a traditional powder blush, I didn’t need to bring my big poufy blush brush AND this was unbreakable (I’ve experienced more than once the misery of opening a blush compact after traveling and finding it in crumbs). Plus, it did double duty as a lip color -- a perfect cheek-lip match! I actually found that I loved the color on my lips better than my cheeks. I applied it lightly for lunch with the fam and put on another layer when we went out at night with his old high school friends. The color lasts and lasts. The verdict -- vintage glam and definitely wearable! M.A.C Just A Pinch Gel Blush was part of the limited-edition Rose Romance Collection and is no longer available. I have this blush and I really wasn't sure about it at first either, but turns out I really like it! I use a stippling brush to apply it and get great results, I found it a little hard to apply with my fingers. I wish this came in other colors too!